When I was youngster my Mother would make pancakes with lemon and sugar every year on Shrove Tuesday without fail. I loved that ritual, and loved spending the time with her in the kitchen getting in her way while she tried to cook them. That’s something I always did to my poor Mother. I had a Tommy Turtle step, that I think was passed down from my Sister, and its sole purpose was to give me a little extra lift to get my nose just above the bench tops so I could watch everything Mum did. Watching her in the kitchen is certainly where my love of cooking came from, but it was the rituals like making pancakes on a special day each year I loved the most. Over time the ingredients I was taught to cook with initially have vanished from my cupboards and have been replaced with others that promote health and well-being. Sadly, my Mamma is no longer with us so I have never had the pleasure of returning the favour and teaching her about all these new products I use, but she was ever so adventurous in the kitchen so I have no doubt she would have embraced them and my change in cooking style. This recipe is suitable for those who are grain, gluten, dairy, soy and nut free. For the latter just remove the macadamia butter from the sauce. It is also low fodmap if the shredded coconut topping is replaced for something like crushed activated nuts or goji berries. For our low histamine friends, this may or may not be suitable depending on how you are with egg white but I plan on trying a version with chia seeds or egg yolk only so will come back here to update if that goes well. The same goes for those with an egg intolerance, I think this would work well if one large banana replaced the eggs but I will try that too and update the recipe. Add the coconut flour and keep stirring until a batter forms. If you still have some lumps its fine. I like my pancakes made with no stress! So no need to fret if you see a lump or two. Heat a frying pan over medium heat and add some coconut oil, once hot enough add in one large spoon of batter. You want the pancakes to be about 8-9cm across but again no stress. Just make sure it’s no bigger than what you’ll be flipping them with as they can break in the centre without full support under them when turning. If you’re one of those clever people who can flip with no utensil, knock yourself out! Repeat until all pancakes are made. I kept mine warm in the oven as the next one was being made but they could also sit in a Thermoserve if you’re a Thermomixer. I got six pancakes from this batter but you may get one more or one less. Add all ingredients to a blender or Thermomix and blend for a few seconds. I like mine a little lumpy but if you want it smoother blend for a few more seconds. 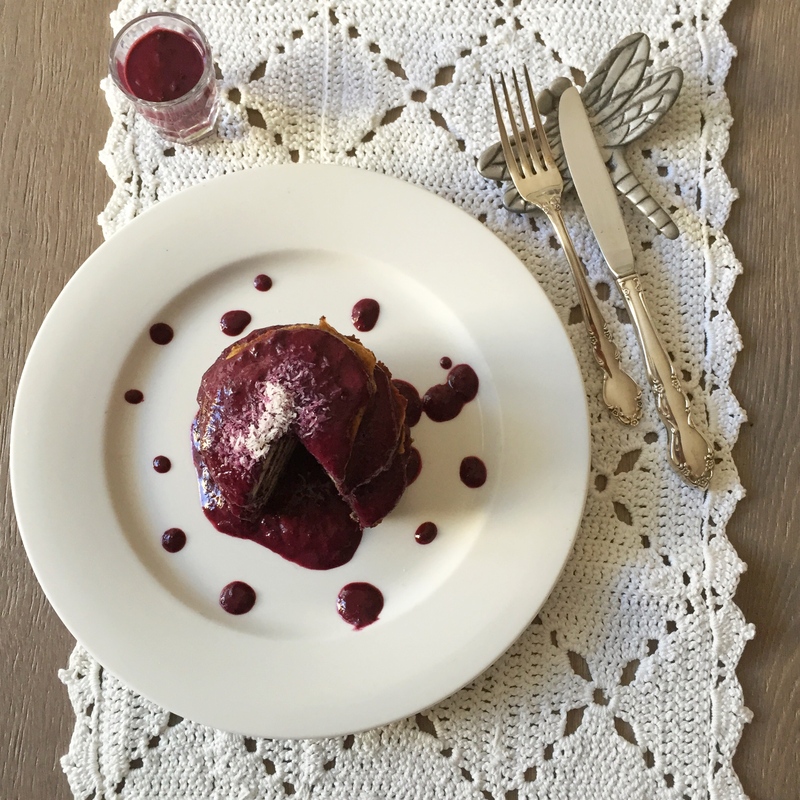 To assemble, place one pancake on a plate, top with some sauce (or lots of sauce!) then place another pancake on top. 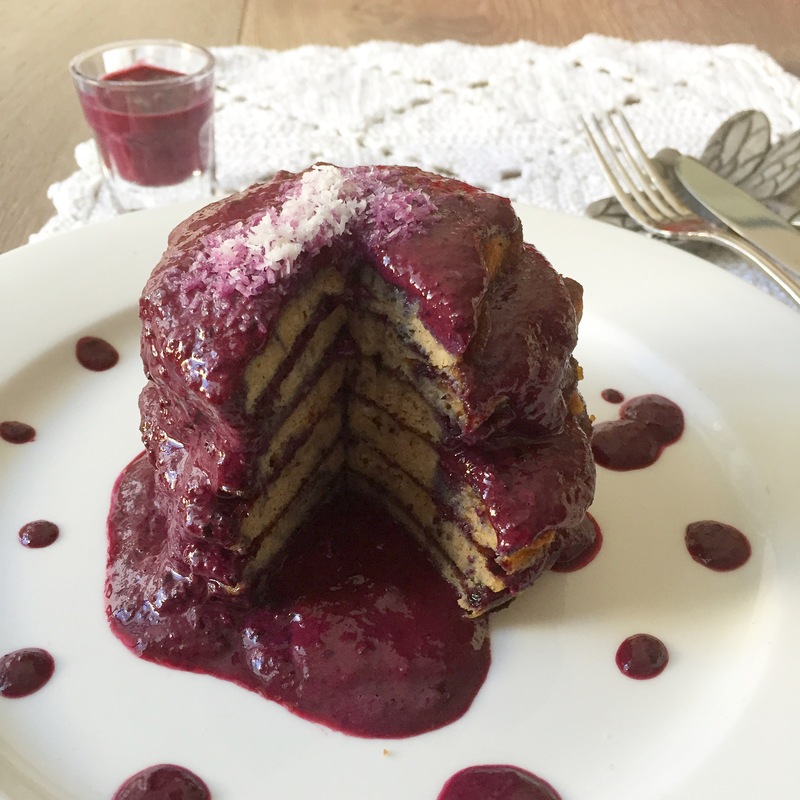 Keep repeating this until you have a delicious stack of pancakes dripping with blueberry and macadamia sauce. Top with a little more sauce and anything else you choose… my favourite is shredded coconut. Three per serve is quite filling. A little note – when you flip the pancakes some of the batter will spread from the sides, but unless you obsessively take photos of everything, it won’t matter. If you are someone like me who needs perfect photos, just trim them and nibble on the yummy crunchy bits while the next one cooks.